There followed a rough map - shown above - depicting Ampthill Park's rugby field, the frogstone and Catherine's Cross, all in approximately the right positions relative to one another. Stretching north from the foot of the cross was a faint shadow, with an arrow and the word “HARE”. P.S It was also very hard to locate you. Far from seeming excited, the mysterious Ken announced wearily that he couldn't go out and dig up the hare that day because he had a cold. As they talked, it dawned on Williams that this man had understood very little of Masquerade's puzzle, and seemed to have stumbled on the hare more or less by accident. His full name, he said, was Ken Thomas, and he'd originally heard of the hare from September 1979's Nationwide broadcast. Knowing what we now do about Masquerade's aftermath, it's impossible to tell how much of the account Thomas offered Williams is true. For what it's worth, though, he said he'd bought a copy of the book a few months after it was published, spotted the “One of Six to Eight” clue and decided that must mean Catherine of Aragon. As he happened to live near Kimbolton Castle where Catherine died in 1536, that's where he started searching. That proved fruitless so, Thomas said, he then deduced from Bedfordshire's local newspaper coverage that Williams must live in the county, and narrowed the likely villages down to two. Driving round these villages in the late summer of 1981, he happened to pass the nearby Ampthill Park and decided to stop there to give his dog a run. Ampthill Park is only 20 miles from Kimbolton Castle but, until his visit there that day, Thomas said he hadn't known the park had any connection with Catherine. It was only when his dog happened to pee against the frogstone, he said, that the verse prompted him to notice Catherine's Cross. Thomas told Williams that he'd returned to Ampthill later, and that this time he'd noticed five rectangular depressions in the grass, following a line to the north. These, he said, looked to be several months old. His seven or eight night-time visits to Ampthill Park which followed, he said, were spent digging in the gaps between the depressions, producing a series of holes each about two feet square but no buried treasure. Thomas told Williams he'd concealed all signs of this work carefully, and then left. That description of a line of depressions stretching north of the cross is consistent with Eric Compton's account of his own work there with John Guard. “The procedure was that we dug a trench, roughly about three foot wide and three foot deep,” he told me as we stood next to the cross. “Then we'd backfill the trench with all that, cover it up with grass clippings and go another three foot across, three foot deep.” If I'm right in guessing that Guard and Compton's digging happened in early 1981, then the depressions they left would indeed have been several months old by late summer that year. Gascoigne reproduces Thomas's version of events in his book, but clearly has his doubts. “Ken seems extremely vague about his astronomy,” he writes. “Although he apparently had a friend (even more reticent than himself) who helped him with the calculations and sometimes went digging with him. This was all a far cry from Mike Barker meticulously correcting his own measurements by that crucial six degrees to find the shadow's proper line. At a distance of 28 feet from the foot of the cross - the precise point where the hare was buried - magnetic north and true north will vary by nearly three feet, and that seems to be a distinction which Thomas had not understood. Williams got more and more cagey as their telephone conversation progressed, and was careful to volunteer as little extra information as possible. Even so, Thomas managed to extract from him that the line of depressions in the soil was off-target, get a clearer idea of how far the hare lay from the cross and grasp that the equinox was important. Cold or no cold, he reports returning to Ampthill next day: Saturday, February 20. He says he hadn't visited the site for a week, and so was shocked to discover the remains of Barker's grave-sized hole at what he now knew was almost certainly the right spot. Suspecting Williams had stolen the prize by digging it up overnight, he phoned the artist and was reassured to find him genuinely astonished by the news. Williams knew no-one had contacted Jonathan Cape, and that suggested the hare was still in place, so he told Thomas to go back to Ampthill Park and to dig again for himself. Thomas says he made three more digging trips to Ampthill Park on the Saturday, Sunday and Monday nights, enlarging Barker's old hole but finding nothing. By now Williams was threatening to contact the press saying the hare must have been found by persons unknown, but Thomas persuaded him to delay a little longer. 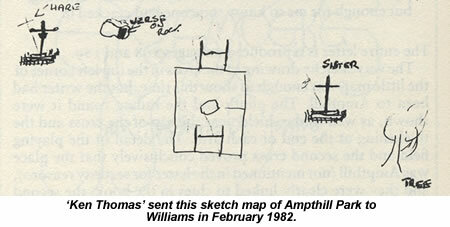 On Wednesday, February 24, Thomas says, he returned to Ampthill Park in daylight, this time with his unidentified friend. Both men were dressed as council workers. They stretched a fence of official-looking tape around the target area, and set about digging again through the earth Thomas and Barker had both already over-turned and replaced. This time, Thomas says, they struck paydirt, spotting the earthenware casket at about 2:45 in the afternoon. Coloured exactly like the dirt that surrounded it, the casket would have been very easy to miss during the many night-time digs which preceded its discovery, and it's perfectly possible that Barker, Guard or Thomas had already uncovered it once and bundled it unseen back into the hole.